Picture this – a baby and his mother, peacefully slumbering beside each other. When the baby stirs, the mother gently wakes, and nurses the baby back to sleep. Both mom and baby feel secure, safe and rested. What could be more natural, or more comforting? Well, the city of Milwaukee feels differently. News of their ridiculous new ad campaign, depicting a baby sleeping next to a knife, has been spreading through the blogosphere this week. The ads were even mentioned yesterday in one of Canada’s national newspapers, the Globe and Mail. The ads controversially state that sharing a bed with a baby is as dangerous as allowing your baby to sleep with a knife. I hate to break it to you Milwaukee, but parents and their babies have been bed sharing since the beginning of time. If it is as dangerous and you make it out to be, explain to me how the human race has survived? Thankfully, Annie who blogs at PhD in Parenting has provided an intelligent response. You can read it here. As Annie points out, co-sleeping is statistically as dangerous as travelling by cars. So does that mean that we should stop taking our kids with us when we drive? Should we walk everywhere? Or should we just try to make both driving and co-sleeping as safe as possible? Every night millions of mothers and babies the world over sleep close to each other, and the babies wake up just fine. Instead of alarming conscientious parents, like the recent shocking and insensitive ad campaign in Milwaukee did, as reported in the Journal Sentinel, sleep advisors should be teaching parents how to co-sleep safely. So what is safe co-sleeping? 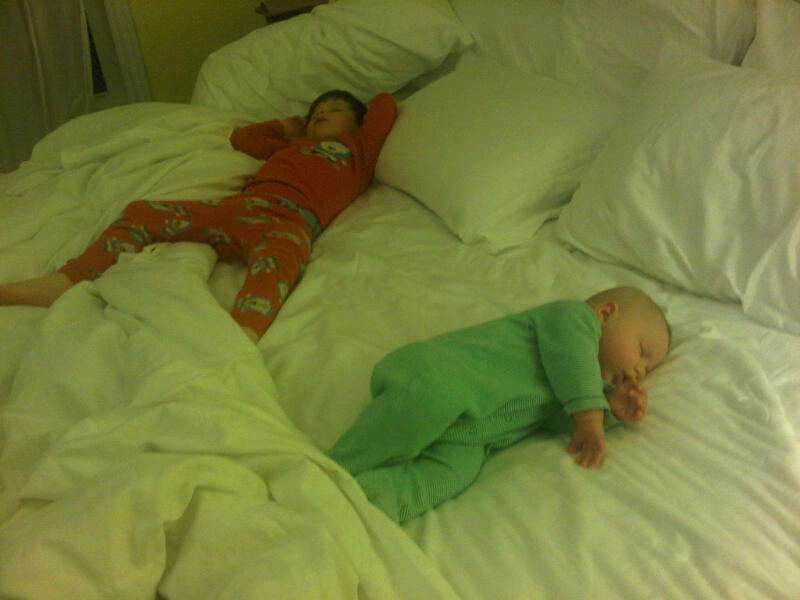 Annie at PhD in has great information in her post entitled “Co-Sleeping Safety“. I highly recommend reading it in its entirety if you are considering co-sleeping, or if you currently co-sleep and want to minimize the risks involved. Milwaukee – my family will continue to co-sleep safely, because it is what works best for us. Everyone is happy and well-rested and your scare tactics won’t work in this house. Categories: Breastfeeding, NaBloPoMo, Sleep | Tags: Breastfeeding, co-sleeping, NaBloPoMo, nursing to sleep | Permalink. When Dylan was born over 3 years ago I just assumed he would sleep in a crib. Every baby I knew slept in a crib (or so said their parents). Dylan, however, had other plans for us. He wanted nothing to do with the lovely crib in his room with the beautiful bed skirt I agonized over at Pottery Barn Kids! He also wasn’t a fan of sleeping in the brand new pack ‘n play that we set up in our room. Dylan was happiest sleeping snuggled right next to me in our bed. I struggled with this the first few months and wasted many hours trying to get him to sleep on his own. After doing a lot of reading and research online, I discovered that many parents co-sleep with their kids, here in North America and especially around the world. By the time Dylan was 6 months old, we gave up on the crib and began to happily accept our sleeping companion. At a year, we dismantled the crib and put a double bed in Dylan’s room, and haven’t looked back since! When we found out I was pregnant with Benjamin, there was no doubt in my mind and Jake’s mind that we would co-sleep with him. In fact, we didn’t even set up the crib this time – it remains in storage. It has been so easy this time without the sleeping struggles. Benjamin’s sleep has really been a non-issue since day 1. During the first few months after Ben was born, I’d put Dylan to sleep in his own room. Then, Ben would sleep in the swing downstairs for a few hours each evening. When I was ready to go to sleep, I’d bring Ben upstairs into bed with me. Dylan would usually wake up at some point in the night and climb into bed with us. And Jake would join us too! I was always sure to keep Ben near me and away from covers, pillows and everyone else. We have a king bed and we found the four of us fit quite easily. Ben and Dylan in bed together back in May...my spot is between the two of them! We kept up this sleeping arrangement for probably 5 or 6 months. Everyone slept quite well! During the summer, we were up at the cottage and the sleeping arrangements changed a bit. At the cottage, we had one room with a queen bed and one with a double. I didn’t think it would be comfortable or safe to have four of us in a queen bed. So, I’d put Dylan to sleep in the room with a double, and Jake joined him when he was ready for bed. The two of them slept in that room all night. Ben and I shared the queen in the other room. When it was just me and the kids at the cottage without Jake, Dylan would start out in the double and then join Ben and me in the queen at some point. We kept this arrangement when we came back home in September. Dylan and Jake sleep in a double in Dylan’s room, and Ben and I sleep in the king bed in my room. This way, each child has an adult to snuggle with! Ben wakes a few times a night to nurse, but always goes right back to sleep. Dylan sometimes wakes up to pee, but otherwise sleeps well. I should add that I now put Ben to sleep in our bed and sneak away once he is sleeping. He doesn’t move much when he sleeps and I listen carefully on the monitor – if I hear him stirring I quickly go to him. He also naps in our bed – I nurse him to sleep and then sneak away. Today I told Dylan that when Benjamin gets older, the two of them will share a room and a bed. Dylan was really excited! I’m not sure when this will happen – perhaps when Ben is 2? Then Jake and I will have our comfy and spacious king to ourselves again. But for now, our sleeping arrangement maximizes everyone’s sleep, and meets the needs of both the kids and the adults in our family. I wouldn’t change it for anything! Categories: Breastfeeding, NaBloPoMo, Sleep | Tags: Breastfeeding, co-sleeping, NaBloPoMo, Naps, nursing to sleep, Sleeping | Permalink. When my first son Dylan was born almost three years ago, my life changed profoundly. While my husband Jake and I were so excited to have a baby and felt ready, nothing could truly prepare us for becoming parents. As soon as he was born, there were so many things we needed to know – how to change diapers, how to give a baby a bath, how to feed a baby, how to get a baby to sleep. And of course how to take care of ourselves while taking care of a baby too! I like to think that Dylan taught us how to be parents. His personality and his needs made us into the parents that we are today. We came to practice attachment parenting because it was the best way of meeting Dylan’s needs while also meeting our own. For example, co-sleeping allowed us to get lots of sleep at night while at the same time meeting Dylan’s need of feeding often at night. Wearing Dylan in a carrier allowed me to get things done around the house while meeting Dylan’s need of not wanting to nap alone. Dylan’s strong need during the early months to breastfeed often and to have me close to him at all times really made me question the “mainstream” way of taking care of kids, where babies and children’s needs are often seen as a nuisance that must be managed. I couldn’t believe that my sweet baby boy was manipulating me with his demands. Instead, Dylan showed me that a baby’s needs are real – they aren’t just wants – they are necessities! Dylan taught me that a baby’s cry shouldn’t be ignored just because they have a clean diaper and have been fed. His cry often meant he needed another snuggle or just wanted to hear my voice or needed to be nursed one more time, perhaps for comfort. I wouldn’t ignore my husband or mother if they were calling out for me – and I certainly wouldn’t ignore my helpless baby! The quote from Dr. Seuss’s book Horton Hears a Who rang true to me after I became Dylan’s mom: ” A person’s a person no matter how small!” And in my book any person deserves to be treated with dignity and respect. I have the privilege of being a mom again now to a second wonderful son. It’s only been a couple of weeks, but I feel so zen this time around. I have Dylan to thank for my calmness and my sense of awe and appreciation. He taught me that the newborn days are fleeting and that every precious moment has to be savored. He taught me that I won’t in fact spoil my baby by holding him all the time. So this time around I’m enjoying my sweet newborn son. I hold him or sleep right beside him pretty much 24 hours a day. I’m feeding him on and off all day and all night long and I’m not resenting it! I know now that you can’t feed a breastfed baby too often and that breastfeeding is a wonderfully convenient mothering tool. So I thank Dylan, my first born son, for having the persistent, strong personality from day one that taught me to parent him as an attachment parent. And I thank my sweet innocent second born son, Benjamin, for letting me parent him as an attachment parent right from the first minute of his life – it is so wonderful to be able to enjoy it right from the beginning this time around!! Categories: Breastfeeding, Sleep | Tags: Babywearing, Breastfeeding, co-sleeping, nursing to sleep, Sleeping | Permalink. I’ve written a number of posts about the joys I’ve experienced nursing my son Dylan to sleep. But getting him to sleep is not just about nursing, it is about parenting. I’ve deeply valued the time I’ve spent parenting my son to sleep and plan to do the same with baby #2 who is due in December. I find it quite disconcerning that anywhere I turn in the “mainstream” parenting world, I encounter people talking about “sleep training”, “controlled crying”, or “crying it out (CIO)”. It sometimes seems as if many parents think they have no choice but to put their children in a crib, leave the room, and hope they fall asleep crying. There are so many “sleep experts” writing books or websites touting the magical solution to getting your baby to sleep through the night through a variety of different methods that usually involve a baby falling asleep on their own in a crib – no wonder so many parents think they need to sleep train! Beware of using someone else’s training method to get your baby to sleep or get your baby on a predictable schedule. Most of these methods are variations of the tired old theme of letting baby cry it out. Before trying anyone else’s method, run it through your intuitive wisdom. Does this advice sound sensible? Does it fit your baby’s temperament? Does it feel right to you?With most of these baby-training regimens you run the risk of becoming desensitized to the cues of your infant, especially when it comes to letting baby cry it out. Instead of helping you to figure out what baby’s signals mean, these training methods tell you to ignore them. Neither you nor your baby learn anything good from this. For us, it never felt right to leave Dylan alone to fall asleep. It felt right and it felt natural to be there right beside him as he drifted off to dreamland. Some of my most precious memories of Dylan as a baby and toddler involve watching his eyes slowly close and observing the peaceful, angelic look that comes over his face once he is asleep. Sometimes we’d have crazy, hectic, tiring days, where I’d lose my patience or just feel fed up. Seeing Dylan’s sweet sleeping face at night always bring back tenderness to my heart and is often just what I need after a long day. I believe that parenting Dylan to sleep each and every night has helped him become the independent, fiesty and loving child toddler that he is. I wouldn’t give up all those hours that I have spent lying beside him for anything. I’m so glad that Jake and I decided to listen to our hearts rather than listen to “sleep experts”. Categories: Breastfeeding, Sleep | Tags: Breastfeeding, co-sleeping, Naps, nursing to sleep, Sleeping | Permalink. When Dylan was 6 weeks old, I enrolled us in a mom and baby class at a local parenting center. I figured it would be a good way to meet other moms and to force myself to get dressed and out of the house. Up until that point, we had been happily co-sleeping. It happened by accident – it was first suggested by a kind and wise nurse at the hospital, and continued at home. When it was time for Dylan to go to sleep for the night, I’d get ready for bed too. We’d both lie in our bed and he’d nurse to sleep and I’d doze off too. As a new mom, it was good for me to go to bed at around 9pm. We were both well-rested. Or at least as rested as you could be with a newborn. So back to the class. It was run by a wonderful lactation consultant who helped me a lot in the early weeks, and a so-called, self-appointed “sleep expert”. I believe that this sleep expert is well-intentioned and has probably assisted a number of extremely overwhelmed and sleep deprived families. However, her sleep ideas did not work for us. One week we were talking about infant sleep patterns. The sleep expert stated that if a baby doesn’t fall asleep by him or herself, the baby will keep waking up all night and will need assistance falling back asleep. So in my case, since I nursed Dylan to sleep, each time he woke he would require nursing to sleep. He was waking quite frequently – usually he’d sleep for a 3 or 4 hour stretch when he first went to sleep, and then would wake up every 1-2 hours after that. But since we were co-sleeping, the wakings were not that disturbing to me. The sleep expert told me that I should try to get Dylan to fall asleep on his own, and that would stop some of the night wakings. Also, she suggested that babies need an early bedtime, and a 7pm bedtime would be more appropriate than a 9pm bedtime. So off I went home after this class. I told Jake everything that the sleep expert had said. She suggested that I nurse Dylan in a rocking chair with the lights on, read him a book, and then give him to Jake, who would rock him to sleep and then place him in his crib. We tried this – at 7pm. It actually worked the first night. Jake got Dylan to sleep and managed to get him in his crib. HOWEVER, Dylan proceeded to wake up every 40 minutes until I finally went to sleep beside him. We tried this again the next night. Even though Dylan was only 6 weeks, he caught on to our plan. Jake couldn’t get him to sleep. Dylan was crying and it was breaking my heart. So I went in and nursed him and of course he went right to sleep. I got him in his crib but again he woke up every 40 minutes unless I was beside him. We tried this for about a wk, and it did not work. I couldn’t stand to hear any crying, even if Dylan was in Jake’s arms. After about a week, I stopped the insanity. We went back to our previous routine of my nursing Dylan to sleep in our bed. This felt much more natural to us and met my needs of getting some extra rest by having an early bedtime, and met Dylan’s needs of nursing to sleep and having his mommy beside him in bed. Over time, as Dylan has gotten older, we’ve moved our bedtime routine to a double bed in his room. And over time, Dylan started to sleep for longer and longer stretches on his own. He is almost 2.5 now and sleeps in his own bed for the majority of the night because he is ready! I still nurse him to sleep, but lo and behold he does sometimes wake up and is able to fall asleep again on his own. 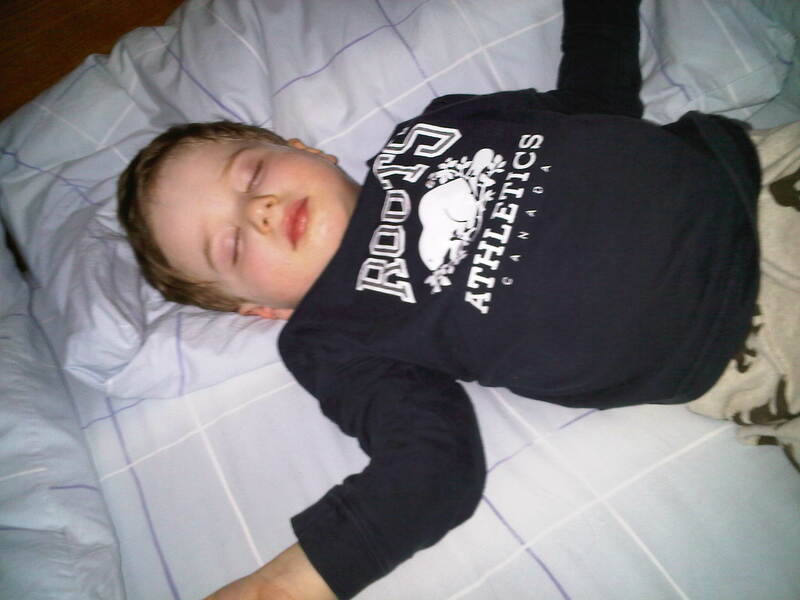 Because he is developmentally ready – not because I “taught” him to sleep on his own. Categories: Breastfeeding, Sleep | Tags: Breastfeeding, co-sleeping, nursing to sleep, Sleeping | Permalink. I often hear from new moms that their babies often or always fall asleep nursing. These moms are usually quite worried that they are creating bad habits or doing something wrong. They are afraid that their babies will never “learn” to fall asleep on their own. 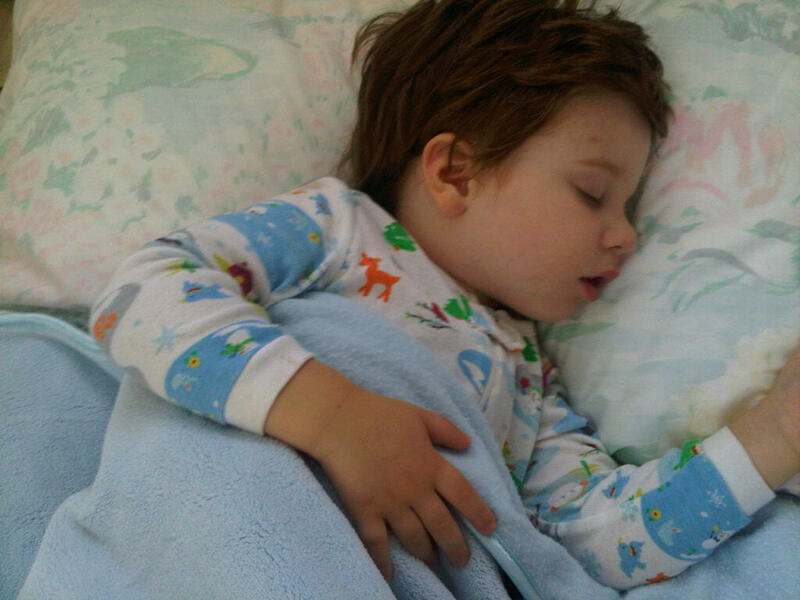 If you want to read about my personal experiences with nursing to sleep, I’ve written a post in the past about the Joys of Nursing to Sleep, and I recently wrote a post about how my 2 year old who has always been nursed to sleep has recently been sleeping long stretches on his own. The Kellymom website provided me with some extremely helpful information when I was a new mom and unsure about nursing to sleep. Kelly’s words made me feel good about my decision to continue to nurse my son to sleep, despite hearing from various well-meaning friends and family that what we were doing was WRONG! My heart told me that what we were doing was natural, and the info below helped me strengthen my convictions. Many moms feel guilty for nursing their baby to sleep. Nursing your baby to sleep is not a bad thing to do! It’s very normal and developmentally appropriate for babies to nurse to sleep and to wake 1-3 times during the night for the first year or so. Some babies don’t do this, but they are the exception, not the rule. Many children, if given the choice, prefer to nurse to sleep through the second year and beyond. Nursing is obviously designed to comfort baby and to help baby sleep, and I’ve never seen a convincing reason why mothers shouldn’t use this wonderful “tool” that we’ve been given. Am I creating a bad habit by allowing baby to nurse to sleep? I’ve been told that baby will NEVER learn to go to sleep on his own if we don’t teach him. How will baby go to sleep when I’m not there to nurse him, or after he weans? How can I gently encourage baby to fall asleep without nursing (and without crying)? My baby sometimes nurses for comfort, when she’s obviously not hungry. My baby wants to comfort nurse the entire time he’s napping! How can I slip away without waking baby? My toddler wants to comfort nurse forever when he’s trying to fall asleep. You are not a pacifier; you are a Mom. You are the sun, the moon, the earth, you are liquid love, you are warmth, you are security, you are comfort in the very deepest aspect of the meaning of comfort…. but you are not a pacifier! It’s not surprising that so many moms feel guilty about nursing their babies or toddlers to sleep when there is so much information out there from so-called sleep experts about sleep training. I hope that other moms receive the reassurance they need from the Kellymom site. Nursing your baby to sleep feels natural and normal because it is! It can even be joyful. What have your experiences been with nursing your baby or toddler to sleep? 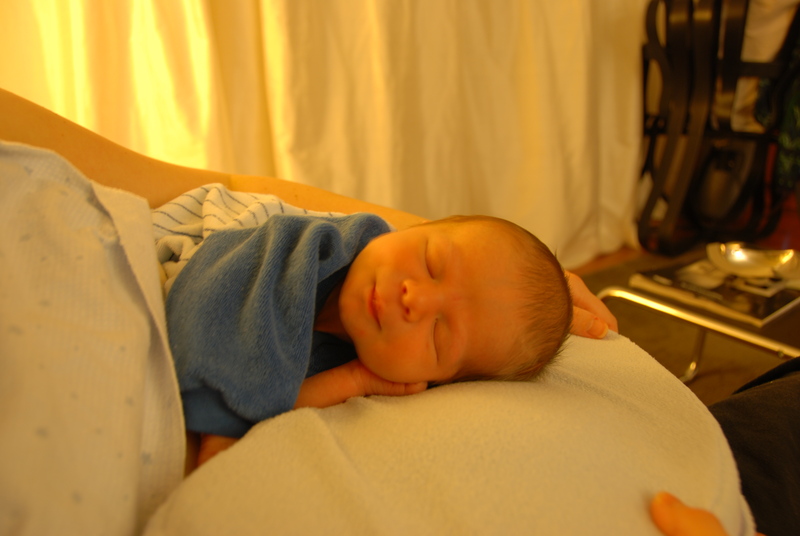 Categories: Sleep | Tags: Breastfeeding, co-sleeping, nursing to sleep, Sleeping | Permalink. From the moment Dylan was born, he liked to be held. He was happy and would sleep soundly as long as he was in someone’s arms. During the first few weeks, I’d spend hours on the couch at home with him nursing on my nursing pillow. He’d slowly drift off to sleep and would have long, lovely naps as long as he remained on the pillow close to me. As soon as I tried to move him and put him down, he’d immediately wake up screaming. I was very confused! We had purchased all these “holders” for Dylan. He had 2 pack n plays, a crib, a bouncy seat and a swing. And let’s not forget the very expensive stroller! Everyone told me that we NEEDED all of these things. And I naively assumed they were right! I thought that I’d feed Dylan, put him in one of these holders, he’d fall asleep and I’d have time to do whatever I wanted. Boy was I ever WRONG! You have to put him down when he sleeps. Otherwise he will never learn to sleep on his own. Why do you carry him around all day in that sling? He looks squished. It’s not good for him. He should sleep in his crib. Get him out of your bed now or he’ll be in there til he’s 12. You’re nursing him again? You must not have enough milk. Give him some rice cereal. Put him down already! You are spoiling him! Most of these comments came from well-intentioned family members. They truly believed that both Dylan and myself would be better off if we weren’t attached all day long! They thought that Dylan would learn to become independent and I would be happier because I would have some time to “myself”. I believed that what I was doing was right, but I needed some evidence to back up my beliefs. I started poking around on the internet and realized that I wasn’t the only one who thought that holding and nurturing a baby is absolutely vital. New parents often ask, “Won’t holding our baby a lot, responding to cries, nursing our baby on cue, and even sleeping with our baby spoil her?” Or they ask if this kind of parenting will create an overly dependent, manipulative child? Our answer is an emphatic no. In fact, both experience and research have shown the opposite. Attachment fosters eventual interdependence. A child whose needs are met predictably and dependably does not have to whine and cry and worry about getting his parents to do what he needs. My heart aches for the baby left alone to learn to “self-comfort”, to “cry it out”. Experts have told moms “not spoil their babies” and to “let them cry”. This is a good thing? What are we accomplishing? Babies need nurturing and it is not spoiling them to provide it. Spoiling means “ruining” and you cannot ruin a child with love and affection. With Dr. Sears and Kellymom on my side, I began to trust my instincts. Dylan is now 2 years old and is fiercely independent! I guess we are doing something right! Categories: Breastfeeding, Sleep | Tags: nursing to sleep, Sleeping | Permalink.